Today we welcome Jaleta Clegg to talk about her latest book coming out, Dark Dancer and whatever other silly questions I can come up with. Jaleta Clegg loves to tell stories of everything from aliens to magical beings to airships to funky tech to silly demons and everything in between. 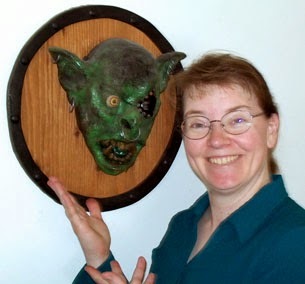 When not writing stories, she spends her time making bizarre things from yarn, cooking up strange dishes, and dealing with all the mundane things we all have to do, like scrubbing the bathrooms and washing dishes. She lives in Utah with a horde of her own offspring (much reduced now that they’re finally starting to move out on their own), too many pets, and a very patient husband. She wants to grow up to be Han Solo or Ursula the sea witch. Or possibly Captain Harlock, because he has the coolest space ship ever. It’s doubtful Jaleta will ever really grow up. 1. What brought you to this genre? What inspired you to write this particular book? 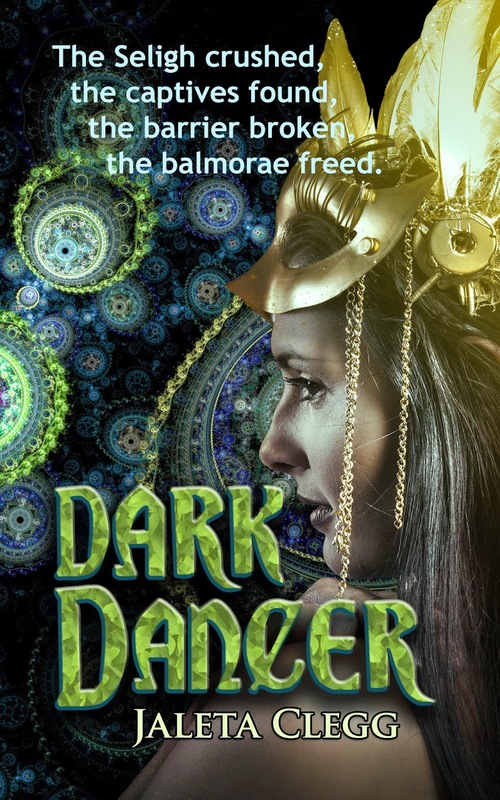 Dark Dancer is a steampunk/fantasy mashup. I was inspired by a friend's book series about humans opening the gates to fairyland and interacting with elves (think more like Shakespeare's fairies and less like Legolas). I thought to myself, that was fun but I want airships. And elves. And magic. I want pirates with pointy ears. The story grew out of that. It's quite a departure from my other work which is science fiction adventure and silly horror. I've dabbled in fantasy, but not this way. It was lots of fun. I may go back to steampunk elves again. 2. Describe your novel in five words. 3. Are any of your characters based on either yourself or people you know? Joren is based on my ideal version of Errol Flynn, does that count? I don't know him personally, but I love his movies. If my characters end up based on people I know, it's all subconscious. 4. How do you react if/when you get any negative reviews? I sit in my closet, cry, and eat too much chocolate. I know my books won't appeal to everyone. And readers have a right to their opinion, good or bad. I respect their right to express that opinion. I know authors who stage campaigns to get negative reviews erased. Some even go so far as to harass the reviewers. That's just wrong. It shows a lack of professionalism. Watching bad 80s sci-fi movies and SyFy channel monster movies. I love a bad campy movie full of cheese. 2. Chocolate or Ice Cream? Chocolate *IN* ice cream. My favorite flavor of ice cream is tin roof sundae - chocolate covered peanuts and fudge in vanilla ice cream. 3. You’re in a horror film. You’re in a house and a bad guy is chasing you. Do you run up the stairs? Naw, I run around in circles screaming because it's always the hot blond who runs in circles screaming who survives. Wait, I'm not blond. That kills that strategy. 4. What’s your favorite music? Disco accordian polka music! *cheesy grin* Yes, that is in my collection, along with everything from heavy metal to classical to Irish folk music to disco to pop. My favorite music is whatever matches my mood at the moment. This site has some really fun ones: http://www.wfmu.org/365/ It's a very entertaining way to spend a few hours. 5. If you could visit anywhere in the world where would it be? Why? A tropical beach that is deserted except for me, my guests, and whoever is providing my food and cleaning my hotel room. I've always wanted to go to the South Pacific. 6. If you had a super power what would it be? Why? Here, pull my finger and find out. Sorry, couldn't resist the Mystery Men reference. That's a really tough question because there are so many cool powers to have. Bubble wand super love magic comes to mind. Wait, that would mean I'm a sailor scout and I don't look good in a pleated mini-skirt. I could fart rainbows and poop sprinkles, but that's unicorns. I think I'll settle for jedi mind powers, like my cat has. He knows if he stares at a door long enough, it will open. I timed him once. He waited over six hours until I opened the door. Who says that wasn't his jedi mind tricks working on me? Thank you Jaleta! And you can participate in Jaleta's Raffelcopter giveaway below!